AI Mastering has been updated. -Fixed the problem that the video and the sound deviated by the mastering of the video. ・ Improved noise reduction algorithm for iPhone version. Improved the iPhone version of the noise reduction algorithm. If the noise volume fluctuates, I think now that noise reduction can be performed better than before. We have updated the VST plug-in "ProMeter" to measure pro sound of sound sources to v2.0.0. ・ We changed the calculation method of Professionality from "professional" to "professional 2". ・ ProMeter was a plug-in for AI Mastering Premium Plan subscribers only, but it was free. I think that the calculation result will be stable by having made it to professionalism 2. The iPhone version of AI Mastering has been updated to v1.2.5. ・ We speed up video upload and reduced transfer volume . It is now possible to master videos encoded with H.264 and H.265 without re-encoding the video part . In the past, all videos, including video, were uploaded to the server, and the server generated output videos. Therefore, when the capacity of the video part was large, upload and download took time . Also, in order to reduce the transfer volume, the smartphone sometimes re-encoded before uploading. Re-encoding took time and the image quality deteriorated . In the modified version, in the case of an MP4 movie made with H.264, H.265 + AAC, the video and sound are Demuxed (separated without degradation) on the smartphone side, and only the sound is uploaded and mastered. When mastering is over, download the sound after mastering, Mux the sound and video on the smartphone side and combine them with no degradation to create an output video. For all other videos, upload the entire video as usual and make the output video on the server side. In this case, the video is re-encoded to H.264 + AAC MP4. As a result, speeding up, high image quality, and transfer volume reduction were realized. ※ In the case of MP4 movie made with H.264, H.265 + AAC, the video part can not be seen when the one uploaded in the smartphone version is viewed in the PC version or in other smartphones. Please note. It is possible to update from the following App Store link. If you have any comments or requests regarding the smartphone version, I would be happy if you can tell us. Please wait for a while as Android is being supported. Introduces tools that can use the AI Mastering API from the command line. Download the latest version of the executable file from the following page. There are executable files for Windows, Mac and Linux. Get the access token of AI Mastering API from Developer . You can execute mastering with the following command. We introduced the tool that can use the API of AI Mastering from the command line. Why did you use the AI Mastering API from VBA when you created a command line tool? It was a request that you have. I hope it will be useful for automation and informal front-ends. The iPhone version of AI Mastering has been updated to v1.1.0. -The maximum video length has been increased to 15 minutes. -The maximum file size has been increased to 250 MB. ・ We changed to perform mastering with automatic mastering algorithm "v2". Please see the following article about v2. AI Mastering's new algorithm "v2"
We will show you how to translate Equalizer APO into Japanese. Equalizer APO is a Windows application that can apply various effects (EQ, compressor, VST) to various sounds (YouTube videos and game sounds) played from a PC. The basic article on how to use Equalizer APO is described in the following article. If you do not know Equalizer APO, please refer to it. Follow the steps below for Japanese localization. The version is described in the title part of Equalizer APO Configuration Editor. Make sure that the version is 1.2. If the version is not 1.2, please update Equalizer APO to the latest version. If the Equalizer APO Configuration Editor is running, it will exit. Download the Equalizer APO Translator. Launch Equalizer APO Translator and press the "Apply Japanese Localization" button to perform Japanese localization. When finished, it is OK to exit Equalizer APO Translator. Launch Equalizer APO Configuration Editor. Set the language setting of the Equalizer APO Configuration Editor to English. It is difficult to understand, but if you set the language setting to English, it will be Japanese. When Japanese localization is completed, it will be as follows. Languages supported by the official Equalizer APO are English and German. If you want to translate Equalizer APO into languages other than English, German or Japanese, you may be able to respond by sending a translation of the translation part of the following file into the target language. However, please note that there is no guarantee that it can be supported. Equalizer APO Translator is an unofficial tool. -Does not support Equalizer APO Translator. ・ We assume no responsibility for any damage caused by using Equalizer APO Translator. We showed you how to use Equalizer APO Translator to translate Equalizer APO into Japanese. It is the result of analyzing "be yourself" of "DÉ DÉ MOUSE" by AI Mastering. How can I get the same sound pressure as "DÉ DÉ MOUSE" and "be yourself"? According to the analysis results, the loudness of "be yourself" is -7.6 dB, so I think that it is better to set to a target sound pressure a little larger than that in AI Mastering and mastering. Because the target sound pressure is high, the Ceiling setting is recommended "Peak" or "True Peak". "True Peak (15 kHz Lowpass)" is too conservative for clipping because it lowers the peak so that it does not clip if it is cut more than 15 kHz due to re-encoding, etc. 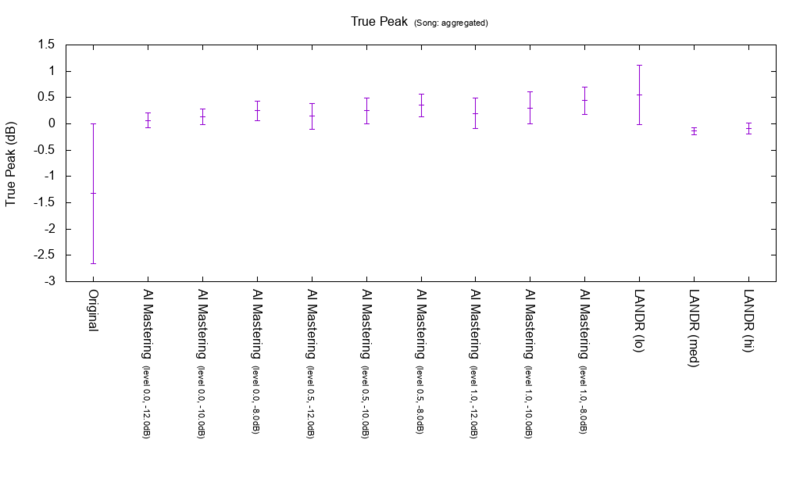 If you set "True Peak", it is recommended to set oversampling to 2x. New mastering algorithm "v2" of "AI Mastering"
AI Mastering has been updated. A new mastering algorithm "v2" has been added. Added new mastering algorithm "v2" to custom mastering. You can select the new algorithm "v2" and the conventional algorithm "v1" in the advanced option. * "V2" is selected for One Touch Mastering (Easy Mastering). Features of the new algorithm "v2"
v2 masters so that "Proposity 2" goes up. Since the search performance of the mastering parameter is higher than v1 , "Prop2" rises with high probability. It is also possible to specify a reference. When a reference is specified, mastering is made so as to approach the reference, not to raise "Prop. 2". You can not specify a preset like v1. It includes processing to minimize the departure from the original sound quality, whether you specify a reference or not. In v1 there was a case that the sound quality changed extremely depending on the sound source, but it is relaxed. The mastering level allows you to adjust how far away you want from the original sound quality. Characteristics of conventional algorithm "v1"
v1 masters so that "Proposity" goes up. As we select the mastering parameters heuristically, the "pros" may not improve much. Changing the mastering parameters of AI Mastering changes "Proposity" in various ways, but adjusting it to increase "Proposity" makes the sound better. Can you automate this? I received an opinion. It is v2 that corresponds to this opinion. Since the search algorithm for mastering parameters is enhanced in v2, mastering is done automatically so that "Prop. 2" becomes large. I think that it will be less time to manually adjust the parameters. "Proposity 2" is an index that improves "Proposity". Added to analytical indicators. We are learning with more data than "Proposity". Please wait for a while as the iPhone version supports the application side. We compared LANDR and AI Mastering in sound quality. We proposed an index that can objectively evaluate the mix MEI 20190207. We compared the sounds mastering with AI Mastering and LANDR at MEI 20190207. We found that AI Mastering has higher MEI 20190207 than LANDR. AI Mastering has a tendency that the loudness range is larger than the LANDR, the Boominess is small, the Depth is small, and the Warmth is small. Mastering various sounds with LANDR and AI Mastering and comparing the results with various indicators. We chose the sound to be compared from the following mix evaluation data set. This mix evaluation data set includes multiple mixed audio for various songs and subjective evaluation results by multiple people for each mixed audio. In the mix audio license, CC BY's, we selected the one with the largest loudness range for each song and the one with the lowest average subjective rating as the comparison target tone. The reason is that it is easy to master without artifacts when the loudness range is large, and there is a mismatch of automatic mastering when the subjective evaluation is low. Please see the GitHub repository below for a specific mix list. 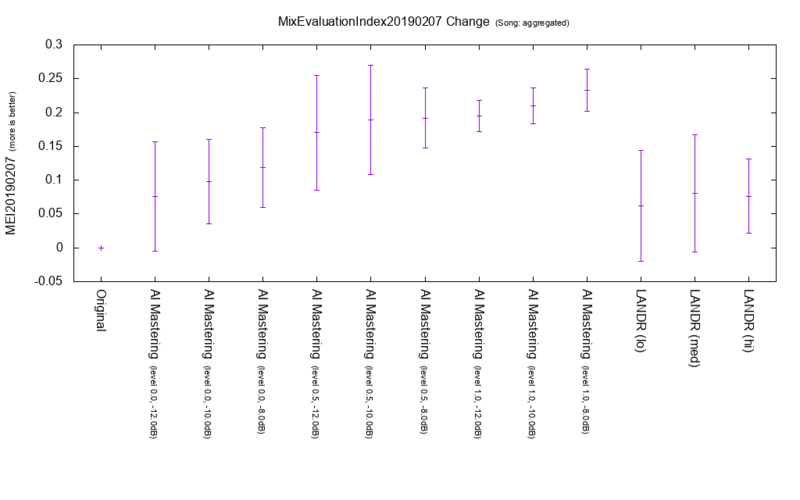 MixEvaluationIndex 20190207 (MEI 20190207) is an objective evaluation index of mixed audio constructed using subjective evaluation data of The Mix Evaluation Dataset. It is an evaluation index of mixed audio, but I think that it can also be used for evaluating mastering audio. It is intended for comprehensive evaluation. It is the main indicator in this comparison. MEI 20190207 is calculated by the weighted sum of various indices. The original indices are the spread covariance matrix of the spectrum, the mean of the spectrum, Hardness, Dissonance. Simply put, I calculate it based on the shape of the spectrum, the dynamic range, the spread of space, the bandwidth of the attack, and the amount of distortion. The mixed audio used for weight learning is all the mixed audio that is published in MixBrowser, with preview audio. Some preview audio was 404 Not Found. It is the loudness defined by ITU-R BS.1770. Depending on the platform to be delivered and how the user listens, it is highly likely that songs with loudness are more likely to be played with louder sounds as compared to other songs. It sounds better as you play with loud sounds. If the sound quality is the same, the loudness should be large. It is the average of MEI 20190207 change with respect to the original for all songs. AI Mastering tends to have higher MEI 20190207 than LANDR. I plotted the average of all songs in loudness and the average of all songs in loudness with a scatter plot. 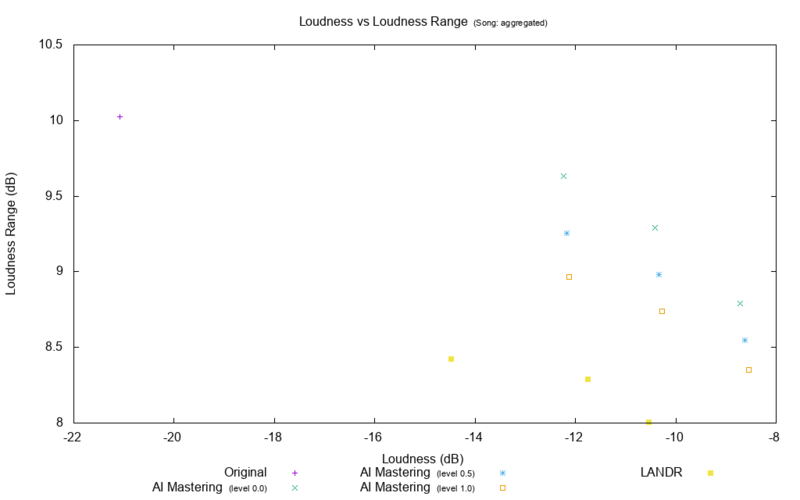 In general, the loudness and the loudness range are in a trade-off relationship, but the decrease in the loudness range when AI Mastering has a higher loudness than LANDR is small. True Peak (inter sample peak) is an average of all songs. If True Peak is larger than 0 dB, it may be distorted due to re-encoding etc, but there seem to be cases where both AI Mastering and LANDR exceed 0 dB. If you set Ceiling to True Peak in AI Mastering, you can prevent True Peak from exceeding 0 dB, so you can avoid degrading sound quality. LANDR is probably impossible to avoid because there is no such setting. 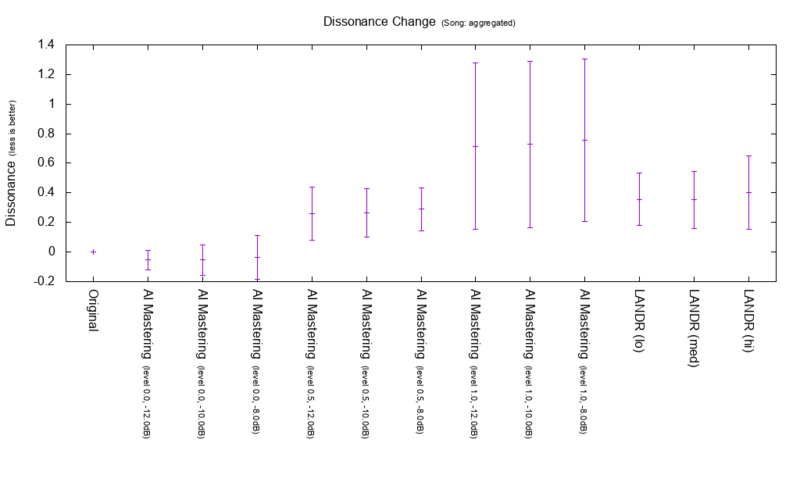 Dissonance is an index to measure dissonance degree. It is used to calculate MEI 20190207, the lower the Dissonance, the higher the MEI 20190207. If you set the mastering level to 1 in AI Mastering, Dissonance seems to increase. Setting the mastering level to 0.5 will result in an increase equivalent to LANDR. 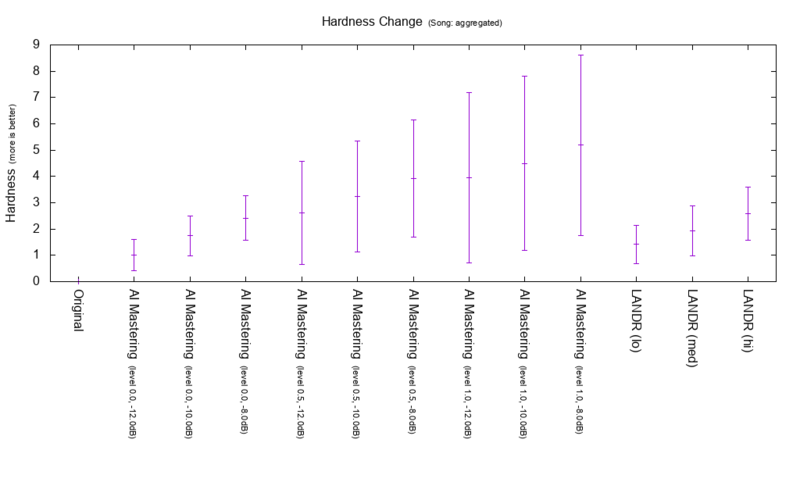 Hardness is an index to measure hardness of sound. It is used to calculate MEI 20190207, and the higher the Hardness is, the higher the MEI 20190207 is. Both AI Mastering and LANDR seem to increase Hardness. 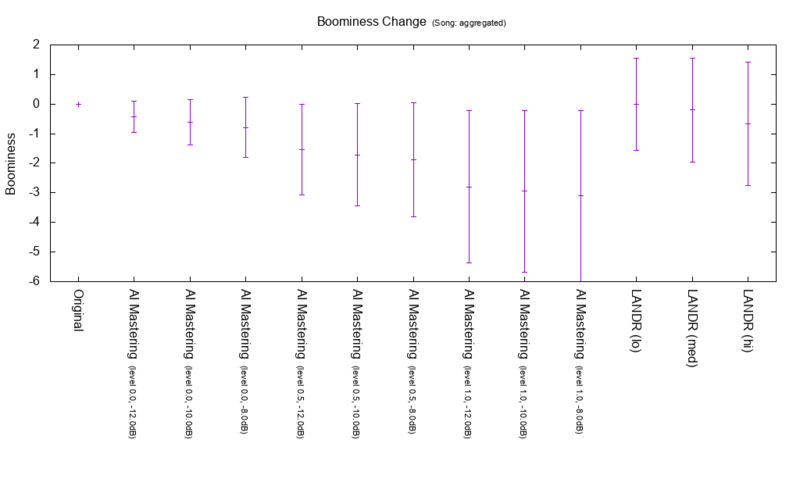 Boominess is an index for Boomy degree. The contents are Booming Index proposed below. It is not used for calculation of MEI 20190207. AI Mastering tends to lower Boominess. Brightness is an indicator of brightness. It is calculated by the linear combination of the logarithm of the energy ratio of the high frequency component to the total energy and the logarithm of Spectral Centroid. It is not used for calculation of MEI 20190207. AI Mastering and LANDR tend to raise Brightness. Depth is an indicator of depth. It is defined in D 5.2 below. According to D 5.2, the depth has spatial meaning and frequency characteristic meaning, but this Depth index represents only frequency characteristic meaning. It is not used for calculation of MEI 20190207. According to the definition, Depth will increase if there are many low frequency components. AI Mastering tends to lower Depth. Warmth is an indicator of warmth. The following is an implementation. It is not used for calculation of MEI 20190207. 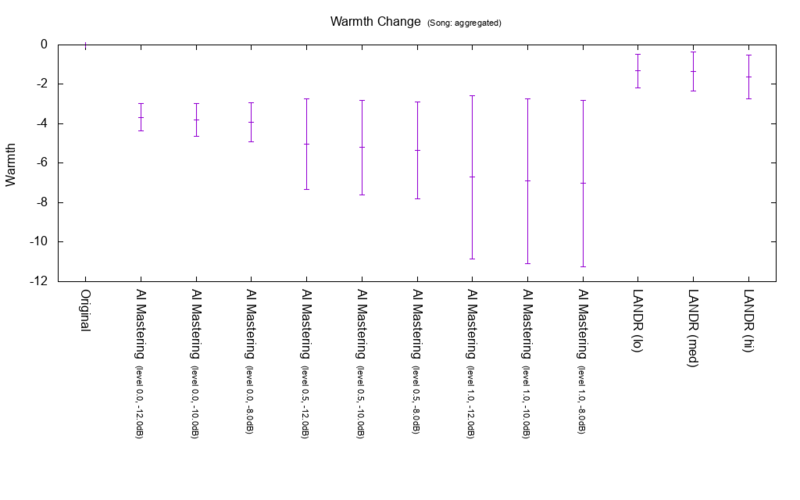 AI Mastering tends to lower Warmth. For each song, I picked up three of the original, LANDR with the largest MEI 20190207, AI Mastering with MEI 20190207 the biggest one. Since loudness is not aligned, please be careful of the bias due to the difference in volume. All sound lists are below. Please try MEI 20190207 whether the high sound is really good sound. The license notation of each song is described under the audio directory of Github. Detailed information is listed below. What is written as "AI Mastering" on the graph or Github represents AI Mastering. I compared LANDR and AI Mastering.